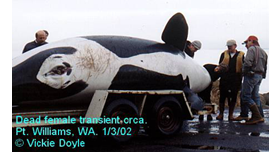 When scientists analyzed tissue samples from the body of CA189, the orca that stranded near Dungeness Spit in 2002, they were stunned by the level of contaminants she carried. Her body had the highest concentrations of PCBs ever measured in a marine mammal. She was also contaminated by large amounts of DDT. Both chemicals have been banned since the 1970s. How did such high concentrations of these contaminants get into her body? Most animals pick up contaminants through the food they eat. CA189, a transient orca, preyed on marine mammals: seals and sea lions, porpoises and whales. Like other transients she foraged up and down the northwest coast from S. California to SE. Alaska, making occasional forays into the Salish Sea. She must have picked up high levels of PCBs and DDT from mammals she fed on in places she visited. How is it possible that today’s marine mammals are so heavily contaminated with these chemicals from the past? One factor is the nature of PCBs and DDT, which are persistent organic pollutants (see sidebar). When they arrive in marine waters, they aren't simply washed out to sea. Nor do they just sink to the bottom and stay in one place. Instead, these fat-soluble compounds are chemically attracted to molecules produced by living organisms. They are ingested and move through the environment in the bodies of fish, invertebrates, mammals, birds and humans. But they are not distributed equally. Orcas and other top carnivores tend to have much higher levels of pollutants than other organisms. The reason for this is shown in the food-web diagram below. In this diagram, small amounts of organic pollutants (shown as dark red dots) attach to phytoplankton (microscopic plants), the base of the food web. When phytoplankton are eaten by zooplankton (tiny animals) the contaminants are passed to them. But zooplankon consume many times their own weight as they live and grow. Over time their bodies will accumulate higher concentrations of contaminants than the organisms they eat. 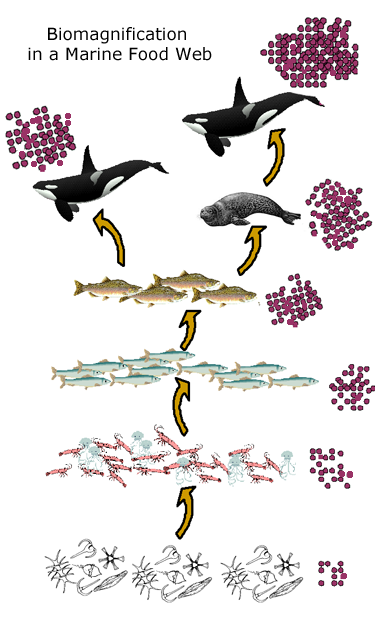 Similarly, every step up the food web results in higher, more concentrated contaminant levels. As top predators, all orcas living today are likely to suffer from high levels of organic pollutants. But transient orcas are mammal-eaters. They feed higher on the food web than fish-eating orcas, leading to higher contamination levels. Scientists measured PCBs at levels of 1000 parts per million in Hope's body. The chart on the right shows how this compares to levels found in other transient and resident orcas, and why these results were so startling to scientists. The chart also reveals something else. If you look closely you'll notice that male orcas of both populations tend to have higher PCB levels than females, even though they eat the same food. This is because organic contaminants like PCBs are fat soluble and are stored in an orca's fat deposits. When a female orca gives birth and nurses her young, most of her fat soluble contaminants are passed to the calf through her milk. Usually this results in adult females having lower contaminant levels than adult males. But Hope was an exception to this pattern. Her contaminant levels were higher than all previously measured levels in any marine mammal of either gender. Although we don't know whether she was ever pregnant, it is likely that she never offloaded the PCBs she carried through nursing, hence the high level in her body at the time of death. Incidentally, Hope was accompanied by a young, healthy male when she died. Initially it was thought he was her son, but now he's thought to have been an unrelated companion. Whatever the explanation, it is also unclear how her high contaminant levels affected Hope’s health. In numerous studies on other marine animals, PCBs have been found to cause a weakened immune system, poor reproductive development and malfunction of the thyroid gland, all potentially serious conditions. Any one of them might have constributed to some of the health issues found during Hope's necropsy. PCBs and DDT are among the chemicals known as Persistent Organic Pollutants (POPs). Made from carbon-based petroleum products, they degrade extremely slowly and can persist in the environment for decades or more. Biological effects of these compounds in animals (including humans) include cancer, endocrine system or immune system disruption, and interference with brain development in the fetus. PCBs are a family of compounds that were widely used as insulating oils in electrical transformers and capacitors, and also as ingredients in adhesives and caulking compounds. Although known to be dangerous to humans for a long time, PCBs were used in the US from the 1920’s until they were banned in 1977. During this time, many PCB manufacturing plants nationwide carelessly dumped PCBs into nearby marine waters, and attempts to dispose of it by burning sent it into the atmosphere, dispersing it worldwide. Urban bays in Seattle, Tacoma and Bremerton, WA have some of the highest levels of PCBs on the west coast. Elliot Bay, Sinclair Inlet and Commencement Bay are particular PCBs hotspots. There are also old PCB dumps on land, where surface water can carry the chemical into the Salish Sea, more than 30 years after it was banned. DDT is an insecticide that was very effective in eradicating the mosquitoes that spread malaria, and it was widely used to control the disease worldwide. In 1962, biologist Rachel Carson published her book, Silent Spring, which raised public awareness about the damage DDT was causing to wildlife, the threat it posed to natural systems and the health risk to humans. The book created a public outcry over DDT and led to it being banned in the US in 1972. Silent Spring is also credited with starting the environmental movement in the US. DDT continues to be manufactured in some developing countries, however, where it is still used to control malaria. DDT levels are especially high in Southern California, near the former site of the world's largest producer of DDT. Until production was halted, untreated DDT waste was discharged directly into the Los Angeles sewer system where it contaminated Pacific Coast waters. The EPA has declared the area a Superfund site, and plans are underway to begin capping and containing the most contaminated locations in 2012. PBDEs, commonly known as flame retardant compounds, are emerging chemicals of great concern. They are chemical cousins of PCBs. Although Hope was not tested for PBDEs, we include information about this family of compounds because they have been found in other marine mammals. For 30 years PBDEs have been applied to clothing, furniture, carpets, and electronic equipment, to keep them from burning if exposed to flame or high heat. Like PCBs, PBDEs are persistent in the environment. In the US, PBDE levels have been doubling in the environment every 3 to 5 years. They are now present in our bodies and in the bodies of animals, including orcas. Animal studies have linked exposure to PBDEs early in life to brain abnormalities, impaired learning and behavioral changes. European countries have banned these chemicals and Washington is among several states that have banned two PBDE compounds, a move which some scientist believe is beginning to lower environmental levels. A third PBDE compound will be banned in 2013 as long as a safe alternative is available. Pollutants --substances that are harmful to a natural resource or that make it unsuitable for specific purposes, like drinking water or farming. Toxins -- chemicals of natural origins, such as snake venom or plant poisons.